It’s that time of the year again—allergy season! Many people in the U.S. suffer from allergies, so you are not alone. In fact, according to the Asthma and Allergy Foundation of America, close to 50 million people are affected by seasonal allergies each year. We wanted to take some time to explain which allergies to expect during the spring and summer and how you, as a parent, can help alleviate your child’s symptoms. Spring is the most common time of year for children to develop allergies, and if you or your spouse have seasonal allergies, chances are your children will develop them as well. The most common trigger is grass pollen, which is small and mostly unseen to the naked eye. There are many different types of grass, and you may be allergic to just one kind. Children with grass pollen allergies may have symptoms like watery eyes, sneezing, and runny or itchy nose. Along with the daily temperatures, weather apps will now provide what the pollen count will be so you can predict how that might affect your day. The summertime is perfect weather for ragweed pollen, which can also carry into the fall. Ragweed is mostly seen in Midwest and Eastern states and can produce 1 billion pollen grains in its lifetime. In addition to all the pollen it produces, it also travels far because it is being spread by wind and bugs. According to the American College of Allergy, Asthma and Immunotherapy, people whose immune system reacts negatively to ragweed will typically have a runny and stuffy nose, itchy eyes, fatigue and eczema. 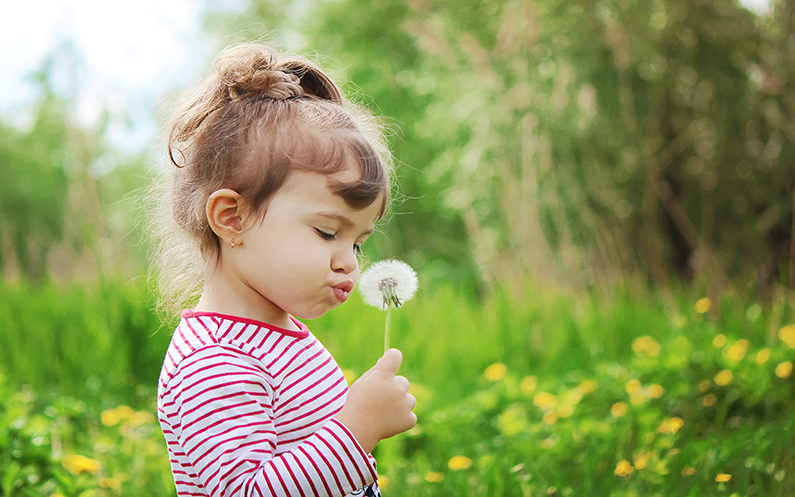 While we can’t get rid of the pollen in the air, we can help you alleviate the symptoms of allergies so that your little ones can enjoy time outside. One of the best ways you can help your child with allergies is to avoid triggers. We realize that this may be difficult, but if you can, limit your exposure to the pollens floating through the air. Encourage your kids to stay inside when pollen counts are high or when it’s really windy. Don’t hang laundry outside to catch potential pollens and make sure your little one’s wear sun glasses to keep pollen from getting in their eyes. If you are inside, be sure to keep windows closed, especially on windy days when the chances of pollen getting into your house are high. Additionally, if you own a pet, make sure your kids wash their hands after petting and playing with them. Talking to your child’s doctor is one of the best ways to help him or her when it comes to allergies. Because children’s immune systems are more sensitive than adults, getting an over-the-counter antihistamine could potentially make them drowsier. There are many medications and shots available for children who suffer from seasonal allergies, allowing your child to enjoy the outdoors instead of dreading it. Here, at Zip Clinic®, we want to make sure that you and your family are well taken care of. If you find that you or your child are suffering from seasonal allergies, feel free to bring them in to one of our eight clinics across Montana, Kentucky and Colorado; no appointment is needed! We are available seven days a week and allow you to check in online so you spend less time in the waiting room.